Whether you’re a yarn-store owner with slow-moving stock, a yarn addict, or just someone who wants to bust their stash; we’ve got 5 easy projects that will knock that pile of yarn down. This project was first introduced as a way to dress up holiday lights. EJ, one of our assembly employees took this idea and ran with it. She pulled yarns from her stash and created 100 Zoom Loom squares to put on a string of lights for her yurt. Keep an eye on her husband’s website for a video on how they attached their lights to solar panels! Perfect for back to school crafting, this pencil case actually uses up the last length of a warp, making sure you’re not wasting any bit of that precious yarn. Make ropes, and then make a vest! The Incredible Rope Machine will completely change how you look at yarn, especially novelty yarns. By mixing and matching yarns, this clever tool transforms otherwise undesirable yarns into something new and exciting! Since the length of each rope is customize-able, you can use up some odds and ends, and then weave them together into a fashionable garment! Use up yarn and fiber stash in this project. Pick out some non-perishable flowers/plants, and weave them into a lovely wall hanging fit for the season. Since just a few materials are used in this project, you’ll have no trouble using what you’ve got. This project is ideal for using up those bits and bobs of yarn that seem too short to work with. Make one for each of your friends, or make a few to have on hand to give as gifts! How do you bust your stash? Let us know on Instagram by tagging your photos with #schachtspindle. The Cricket Loom is compact, capable, and cute! The Cricket is available in a 10″ or 15″ weaving widths. The Cricket is made of high-quality maple ply and hard maple and is left unfinished. Each Cricket comes with an 8-dent reed (sorry, no substitutions). We also have 5-, 10- and 12-dent reeds. 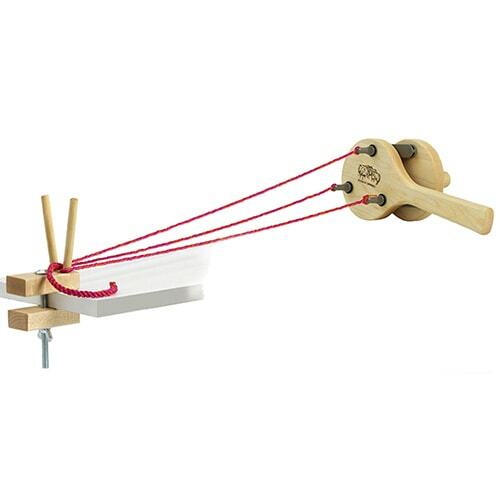 Included are a threading hook, warping peg, table clamps, two shuttles, and two balls of yarn. This simple frame loom ensures success. We’ve designed this loom to be easy to warp and weave on. It has a 15″ weaving width, a built-in stand for upright use on the floor or a table top, plus durable, 6 per inch, plastic warp spacers for uniform warping. Students of all ages will find it easy to use. Included with each loom are two pick-up sticks, a weaving needle, and simple warping and weaving instructions. The School Loom is made of hard maple and left unfinished.